2016 marks 400 years after William Shakespeare’s death, and the world is celebrating the quatercentenary with Shakespeare performances, festivals, and fireworks. One hundred years ago, what was said about the Shakespeare tercentenary in the United States? We see one of these windows on the past in The New York Times, which ran a special Shakespeare commemorative series from February 20 – April 23, 1916. Woodrow Wilson was president, and America was one year away from joining the British in World War I. The series featured essays by scholars, as well as prints of illustrated scenes from Shakespeare plays and well-known actors in Shakespearean roles. Note the picture of Edwin Booth as Hamlet for this first insert. The New York Times, Shakespeare Tercentenary, Feb. 20, 1916. Folger Shakespeare Library. Shakespeare died on April 23, 1616, either on or soon after his fifty-second birthday; and that date in 1916 is to mark the climax of an observance, which has already begun, of one of the great events of history. It will then be 300 years since there ended a life which has had an effect altogether incalculable not only upon the literature of the whole world, but upon the subsequent life and history of the world. His existence on this earth was one of the profound influences upon human development; and it is as such, not solely as a great poet, that the tercentenary of that existence is being commemorated everywhere. 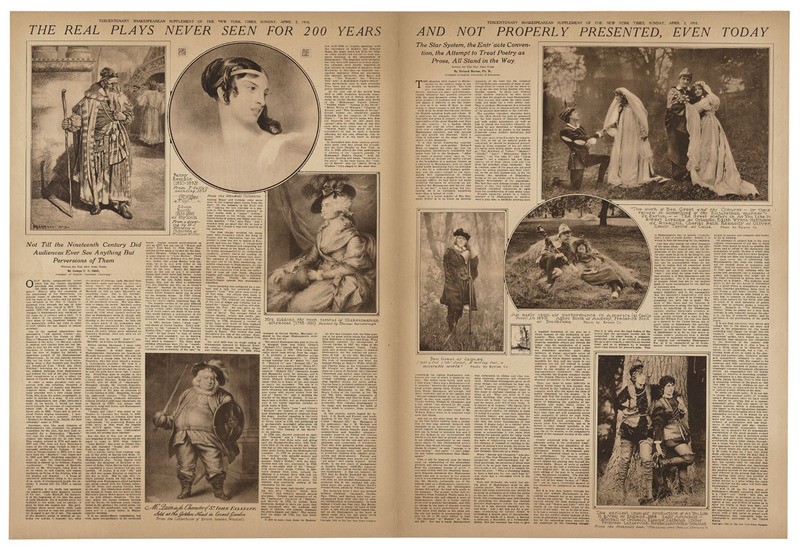 The New York Times, 300th Shakespeare anniversary special editions, April 16, 1916. Folger Shakespeare Library. One result of the present war, whether for good or ill, is the increased national consciousness of all the belligerents. Even we, in the security and dispassionateness with which our distance from the theatre of war should endow us, are apt to regard our brothers across the seas as Allies or Teutons, losing sight of the common bond of human sympathy that should unite us all. Small wonder, then, that this misconception has been carried over from the stormy realm of political activity to the field of literary criticism. It is to this false perspective that we can most charitably ascribe the tenor of Shakespeare articles which have lately been appearing in English publications. When The London Daily Mail purports to give a German viewpoint, and says: “All good things are German; Shakespeare is a good thing, therefore Shakespeare is German,” or that the Germans have “chosen Shakespeare to annex, like a hostile province,” it presents a perverted truth to its readers. As a matter of fact, Shakespeare has been long appreciated and love, I had nearly said idolized and worshipped, in Germany and in England. Shakespeare’s transcendent genius belongs to no one nation. 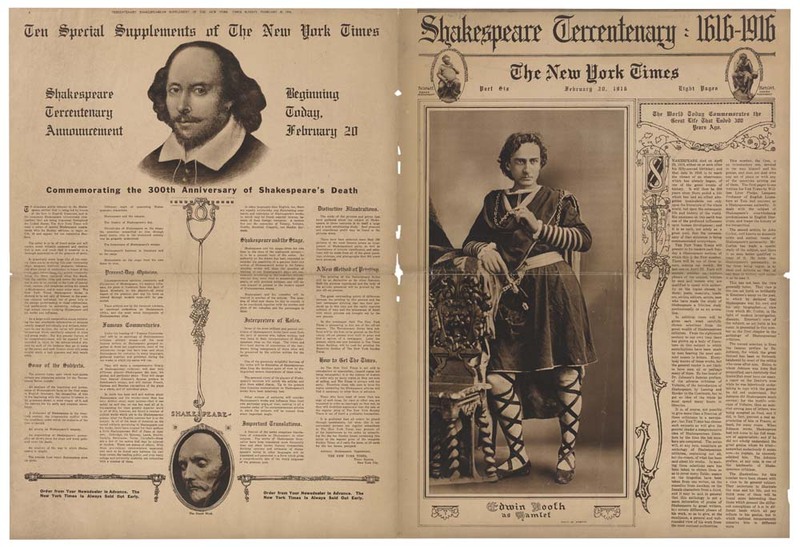 The New York Times, 300th Shakespeare anniversary special editions, April 2, 1916. Folger Shakespeare Library. Loose-knit, sprawling chronicle history and spectacle, like the two famous dramas mentioned, emphatically lack the strict denotements of real drama, if drama today be a distinct genre among the forms of literature. And the sooner we have the honesty and common sense to acknowledge it and cease from blaming the general public for being bored when it is asked to witness such things for the sake of brightening now and then at the the entrance of Falstaff or thrilling to the music of Antony’s love words, the better for the genuine appreciation of Shakespeare and dramatic literature as a whole. Yet another contributor to the Times series draws a comparison between the characters of Don Quixote and Hamlet, writing that “in these two characters are embodied two basic, opposite peculiarities of human nature–two poles of the axis about which it is revolving.” The characters’ creators, Shakespeare and Cervantes, died in the same year. For more on these two authors, read the Shakespeare & Beyond blog post series by Kathryn Swanton. Curious about Shakespeare’s influence on America’s history and identity? 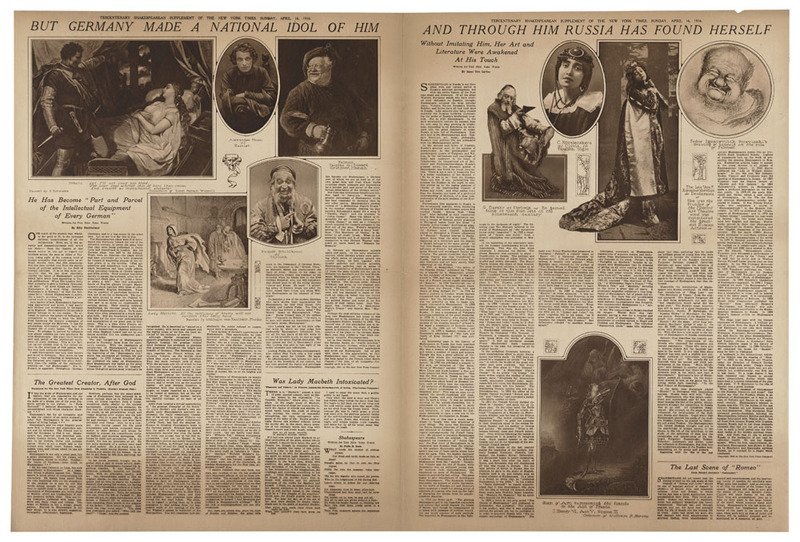 Want to see this newspaper insert in the context of America’s long and passionate relationship with Shakespeare? Visit America’s Shakespeare, a Folger Shakespeare Library exhibition, through July 24, 2016. What do you think will be said about Shakespeare in 2116? Tell us in the comments below.